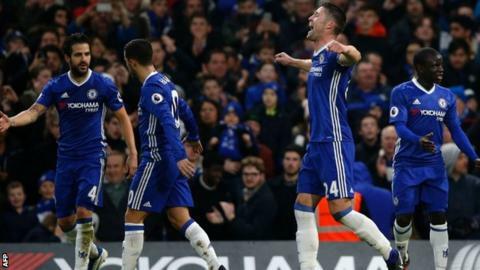 Premier League leaders Chelsea equalled the top-flight record of 13 consecutive wins in a single season by beating valiant Stoke in a thriller at Stamford Bridge. An exceptionally entertaining second half included five goals as the Blues were twice made to retake the lead by a Potters side who gave them one of their toughest tests this season. Gary Cahill gave Chelsea the lead when he headed in shortly before half-time, but Stoke defender Bruno Martins Indi levelled only a minute after the break when he poked in from close range. Willian handed the Blues the advantage again only for Peter Crouch to level with a side-foot effort high past Thibaut Courtois. Stoke barely had time to celebrate, as moments after the restart Chelsea drove towards goal with Willian applying a fierce, angled finish. With five minutes remaining, the Blues all but sealed the three points when Diego Costa - magnificent as a target-man - shrugged off the attentions of Martins Indi to fire in the fourth. Chelsea have a six-point lead over second-place Liverpool who defeated Manchester City 1-0 in the late Saturday game. This was a brutal test for Antonio Conte's men. Stoke were organised and disciplined at the back and threatened at the other end. In fact, until Cahill's goal they were the better team and looked more likely to score first. Their spirit was not broken even after Cahill's opener, and seconds after the interval Martins Indi converted his first for the club from Crouch's nod-down. Chelsea's potent attack compensated for their failings at the back, and 11 minutes later Victor Moses and Hazard combined before Willian poked in. But yet again Stoke, who had not won a league game at Stamford Bridge since 1974, fought back. This time it was Crouch who got on the scoresheet in the league for the first time since May 2015 when he tucked home under pressure. Stoke had gone a remarkable 56 games without an Englishman scoring until Crouch's second-half effort. The longest English goal drought belongs to Arsenal, standing at 97 games until Theo Walcott's brace in a 2-2 draw with Birmingham in February 2008. However, Conte's Chelsea have shown great resolve this season. Just a minute after the second equaliser, Cesc Fabregas found Willian in the area and he rifled in from a tight angle. With five minutes remaining, Costa finally got his reward for an outstanding display with a close-range strike past the reach of goalkeeper Lee Grant. Stoke threw everything at them and came away with nothing - but they will take some solace that they were playing the best in the league. There was a moment late in the second half when 6ft 2in Spain forward Costa was involved in what seemed a minor altercation with a Stoke defender in the opposition area. That 'moment' was swiftly ended by the alert refereeing of Bobby Madley. But would it have become more serious? Because the Costa of this season is very different to the Costa under the old management of ex-Blues boss Jose Mourinho. His Achilles heel was confrontation, but all his aggression appears now to be channelled towards simply outmuscling those who dare to mark him. Martins Indi - 6ft 1in and equally stocky - was given that task at Stamford Bridge and did a good job until the 85th minute when, like a rugby forward trying to make a try-saving tackle, he lost his grip of Costa, who punished him with Chelsea's fourth. But it is unlikely Martins Indi will be given such a workout by any other striker for the rest of the season. Chelsea's lead man has great feet plus pace, channelled aggression and now 14 goals this campaign. A contender for player of the season? "Congratulations go to my players. To win 13 games in a row in this league is very difficult. "Stoke played very well. They hit long balls to Crouch and fought for the second ball. My players showed they can adapt to the different kinds of game we face. They showed great commitment, work-rate and will to win. I'm delighted for them. "Now, it's important to celebrate the arrival of the new year, then to think of the next game against Tottenham. "Numbers are not important if you do not win the title. Now, they are fantastic and we are proud, but we must concentrate on the second part of the season." "It's a similar story to our efforts at Liverpool. We got back level, but then conceded poor goals. We've made mistakes and good teams punish you. "I thought we did really well, showing courage to get back in the game. I thought we were good value to get a draw, but we can't keep on making the mistakes we are at the moment because it's hurting us. "We were positive, got back level and it was up for grabs. For their third goal, the ball went through about four of our players. We can't keep defending as we are in key moments. If we take that out of our game, we will be fine. "Mistakes happen, the opposition can affect what you do. You have to understand the time, the moments of the game." Chelsea are just the second Premier League team in history to win 13 consecutive games in a single season, following Arsenal in 2001-02. Fabregas registered his 100th Premier League assist - the fourth player to achieve this feat (Ryan Giggs - 162, Frank Lampard - 102, Wayne Rooney - 101). Fabregas was the quickest player to reach 100 Premier League assists, however (293 apps). It's the first time Fabregas has assisted in back-to-back Premier League games since January 2015. Costa has had a hand in 19 Premier League goals (14 goals, five assists) this season. In only three games has he failed to either score or assist a goal. Crouch scored his first Premier League goal since May 2015 v Liverpool - 587 days ago. Martins Indi netted his first Premier League goal just 55 seconds into the second half. It was the quickest Stoke had scored in the second half since April 2013 (Charlie Adam v Norwich, 45:51). The Blues face a tough test at Spurs on Wednesday, 4 January (20:00 GMT) and Stoke are at home to Watford (20:00 GMT) a day earlier. Match ends, Chelsea 4, Stoke City 2. Second Half ends, Chelsea 4, Stoke City 2. Corner, Chelsea. Conceded by Ryan Shawcross. Attempt blocked. Marcos Alonso (Chelsea) left footed shot from the left side of the box is blocked. Assisted by Nemanja Matic with a through ball. Attempt missed. Marcos Alonso (Chelsea) right footed shot from outside the box is close, but misses to the right. Assisted by N'Golo Kanté. Charlie Adam (Stoke City) is shown the yellow card. Goal! Chelsea 4, Stoke City 2. Diego Costa (Chelsea) left footed shot from the left side of the box to the top right corner. Substitution, Chelsea. Nathaniel Chalobah replaces Willian. Corner, Chelsea. Conceded by Glen Johnson. Substitution, Chelsea. Branislav Ivanovic replaces Victor Moses. Offside, Stoke City. Charlie Adam tries a through ball, but Peter Crouch is caught offside. Offside, Chelsea. Eden Hazard tries a through ball, but Diego Costa is caught offside. Attempt missed. Diego Costa (Chelsea) left footed shot from the centre of the box is too high. Assisted by Eden Hazard following a fast break. Corner, Stoke City. Conceded by Gary Cahill. Substitution, Chelsea. Nemanja Matic replaces Cesc Fàbregas. Bojan (Stoke City) wins a free kick in the defensive half. Marcos Alonso (Chelsea) is shown the yellow card. Mame Biram Diouf (Stoke City) is shown the yellow card. Attempt missed. Willian (Chelsea) right footed shot from outside the box misses to the left. Goal! Chelsea 3, Stoke City 2. Willian (Chelsea) right footed shot from the centre of the box to the top right corner. Assisted by Cesc Fàbregas. Goal! Chelsea 2, Stoke City 2. Peter Crouch (Stoke City) right footed shot from the centre of the box to the high centre of the goal. Assisted by Mame Biram Diouf. Attempt missed. Diego Costa (Chelsea) left footed shot from outside the box is too high. Assisted by Eden Hazard. Substitution, Stoke City. Giannelli Imbula replaces Ibrahim Afellay. Substitution, Stoke City. Bojan replaces Xherdan Shaqiri. Cesc Fàbregas (Chelsea) wins a free kick in the defensive half. Cesc Fàbregas (Chelsea) is shown the yellow card for a bad foul. Ibrahim Afellay (Stoke City) wins a free kick in the defensive half. Goal! Chelsea 2, Stoke City 1. Willian (Chelsea) left footed shot from the centre of the box to the bottom left corner. Assisted by Eden Hazard. Offside, Chelsea. Willian tries a through ball, but Victor Moses is caught offside.